Capcom may be content to allow Mega Man's 25th birthday to pass without a brand-new adventure, but creator Kenji Inafune has taken matters into his own hands and is attempting to make a spiritual successor to the Blue Bomber via Kickstarter. Mighty No.9 is Mega Man in all but name, featuring a familiar premise (you're a robot who can steal the weapons and abilities of enemies) and similar art style. 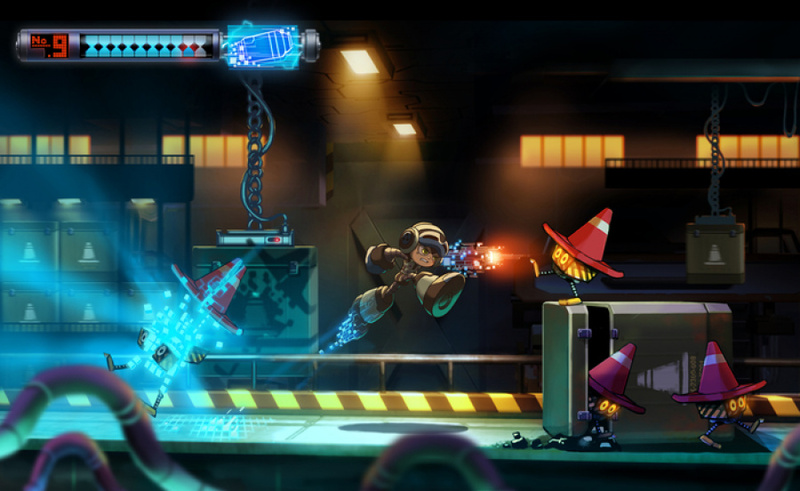 However, while Inafune is clearly looking to exploit his connection with Mega Man, this new game does boast some fresh ideas — most notably the main character's ability to reconfigure the arrangement of his limbs to create new gameplay possibilities. For example, you can bolt a magnet onto his arm to grip to walls or install spring-loaded Inspector Gadget-style hands to activate distant switches. Inafune's involvement will surely be enough to have Mega Man devotees reaching for their wallets, but it's worth noting the depth of talent with the comcept USA team. Game designer Naoya Tomita has worked on several Mega Man titles — including the original game, Mega Man 2, 5 and 6. He was also involved with Mega Man Legends 3 before it was cancelled. Character designer Kimo has worked on Capcom classics such as Darkstalkers, Street Fighter Alpha and The Legend of Zelda: Minish Cap, which Capcom co-created alongside Nintendo. Composer Manani Matsume was responsible for the soundtrack to the original Mega Man, while Art Director Shinsuke Komaki is another long-time Capcom staffer and has worked on Mega Man X3 and the Battle Network titles. Inafune and his team are looking to secure $900,000 to produce the game on PC, but if $2,500,000 is raised then PS3, 360 and Wii U versions will be unlocked. At the time of writing the project has gained almost $300,000 from just under 5,000 backers with 30 days remaining. The game is currently slated for a Spring 2015 release. We can imagine that Mega Man fans are probably going crazy right now — this is the kind of thing Capcom really should have done with character to properly celebrate his birthday. Will you be investing? Do you think the project will reach the lofty Wii U stretch goal? How do you think Capcom feels about this venture? Leave a comment to share your feelings on Mighty No. 9. Pledged $20. Really hope we get a Wii U version! Seeing as how one of the 4 projects I have backed finally finished, I can back another one. <3 Wii U stretch goal needs! Quite a big stretch for Wii U. Time to see how many fans of 'Mighty Man' are out there. That was a touching video. Mr. Inafune truly cares about MegaMan fans who have no hope left for Capcom reviving the franchise. I hope this project comes to be; especially on Wii U! This project is beautiful, that video was amazing. @Austroid Yeah, that's one of the best KS appeal videos I've ever seen. Loved seeing him going retro game shopping. I'm wondering if Mighty No. 9 is set in the same world as Mega Man. Don't worry man, next paycheck I'll donate to the cause. @GamerZack7 He's not allowed to use anything related to Mega Man. That IP is the property of Capcom. This sounds awsome. As far as what Capcom thinks of it, WHO CARES! You snooz, you lose. Capcom should've done a modern Mega Man ages ago. I really hope the developers reach their targets for the console release. Pledged $60. Better this than a couple games I probably wouldn't start for at least another month or so (Etrian IV and a eShop card; still ploughing through SMT IV, with FE:A on deck). This sounds awsome. As far as what Capcom thinks of it, WHO CARES! You snooz, you lose. Capcom should've done a modern Mega Man ages ago. I really hope the developers reach their targets for the console releases. i dunno, i looks like Mega Man and the concept arts also look like Mega Man. I know this is part of the premise, but i hardly saw any ''new'' ideas. I seems as Inafune isn't done with Mega Man and just keeps going without CAPCOM and just with slightly new visuals so he doesn't get trouble from CAPCOM. It feels strange. It feels like this should have been official Mega Man but the circumstances didn't allow it to be. And this aspect just irks me. I fully understand the reasons for all that and i don't really find anything wrong with the game as shown. But still...this new game is just a way for him to be able to work on Mega Man without CAPCOM. 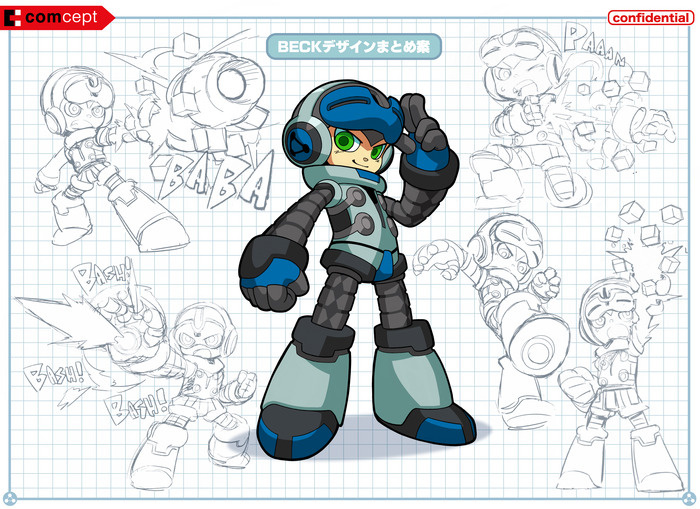 So i blame CAPCOM for this project not beeing really Mega Man. And this feels strange man. Am I the only one who thinks that 900 grand and $2.5M are a lot to ask for for a side scroller? This is only the third Kickstarter I've contributed to but with Keiji Inafune involved and it being a spiritual successor to the Mega Man series there was no way I was passing it up. I hope Capcom doesn't sue him.I know the game is a spiritual successor to the Mega Man series but some things are too similar to it.Especially the blonde girl,I can tell at first glance that she's Roll(Mega Man's sister). Once I get paid I will be backing this game, asap! well this made my day! MIyamoto and Inafune were always the two videogame-head masterminds that i've always admired. Praying that Mighty 9 makes it onto the Wii U and 3DS. Mega man has officially been reborn...Capcom can't seem to figure out what to do with the franchise anyways, mega man in SSB.U is as good as it's going to get. I never back Kickstarter, but I pledged for this one. This MUST come to Wii U. It must. Oooweee that's a slammin' combo right there- SMT 4 then FE Awakening, yeah you know how to pick em! hey, will anyone here donate 10,000 to have a dinner with inafune?!?!?!?! or will you guys donate 2,500 to get your face in the game? What happened to that penguin pirate game? Shorry if I shpeak like gheese, buth ghis eah-thoo-eah shmile jusht doeshn't want to go away. Waiting for Capcom to threaten legal charges then release the game as part of the Mega Man celebration. Wow, 400k in just 8 hours! Maybe that 2.5 million mark will be met by the end of the month so the game might make it to Wii U! i dont have that much to do with mega man but 3:00 looks like a big mega man reference. inafune looking like the blue bomber and that dog looks like that robot dog from mega man. few minutes after that the construction builder's hat remembers me of those small things with the yellow hats. Hope this makes it to Wii U, if not ill settle for the pc version. This is cool and all, but what happened to the game he announced in 2011? Where is Kaio: King of Pirates? Cool, but I wish he didn't name it "Mighty". Nope, if anything it's suspiciously low. It costs around 500, 000 to 1.5 mill to make a 3DS game, I think, so I would expect it costs a lot more to make a platformer for consoles/PC. with higher graphical expectations. Wow. Someone has paid 10 000 $ to have dinner with Inafune. The game looks great, but 2.5million is asking way the hell too much. I don't know. I'm a big Mega Man fan, and as such I'm bound to be excited by a new Inafune project, but this pretty much IS Mega Man. He's ripping off his own creation rather than try a new idea. Chances are I'll give it a try should it come to Wii U, but I still feel it's incredibly lazy of him. @GeminiSaint right? Id rather he kickstart thay if needed, seemed way more original than this. Dont get me wrong, id day 1and this for wii u if it meets stretch but id donate for king of pirates. @Royalblues What's wrong with the game being called "Mighty"? This will be the ultimate "true" successor to Mega Man. Not whatever Capcom spews out and hoping to milk DLC out of the consumers. I will more than likely get either the PS3/360 version of it (I like achievements/trophies). Still this is great news! For those saying that 2.5 mil is too much....it really isn't. Don't underestimate the fans of Mega Man or now Mighty #9. There are fans like me who have loved Mega Man since the 80's. Also there has already been someone who donated 10,000. This will reach it's goal in NO TIME. @ricklongo You can't ripoff your own creation. Someone else has to do it for it to be considered a ripoff. @Rafie It's still recycling ideas. It's like if Miyamoto's new IP was a different game about another Italian plumber. I'd be disappointed, like I am in this project. Like I said, I'm definitely willing to give this a try, but the level of excitement just won't be the same as it would be with a truly fresh idea. -2015, but PS3 & X360? Less bothersome, 'cause it's Wii U I want it for. Well, if this kickstarter turns out to be successful, then more power to him. I'm not a huge fan of Mega Man style games, but I'd try a demo at the very least. Its halfway from the $900000 in less than a day. I'm really impressed, looking forward to this game. Im excited for this game. It's like a new Mega Man, only...it's not Mega Man. I hope it reaches it's stretch goals and gets a console release, if it does i'll buy it on the Wii U.
I have been on Kickstarter a quite a few times, but haven't backed anything. I think this is the first thing I wanna back, because I truly think this could be a great game. I will probably drop $20, since you get a digital version of the game, hopefully we get to pick which platform, if its on multiple. This is the first time I've ever backed anything on Kickstarter. Mega Man is one of my favorite series and I'd like to see a more modern take on it, which Capcom doesn't appear to be interested in, so might as well let the guy behind the series do it independently. I really hope it reaches the console stretch goal, would love to have it on Wii U. What about a 3DS version? @Metaknight_3Raw I don't think this is all the money they're going to spend in the game. That would be insulting, they must have some investors. The Witcher 2 cost $10M to develop (official numbwr, given by the studio). always loved megaman! this looks like he gets to use a lot of new ideas he probably had for megaman but capcom was content with making it the same every time. i can't wait! i still say 2,500,000 is a bit much to get it on the wii u!!! My god, its literally getting thousands of dollars every minute! Its up to 480,000$! @DarkCoolEdge - I agree with you. It does seem like a lot and doesn't seem like it would be too massive. Slightly altered Flame man in there (If I got the name right, I don't play much or any Megaman). The Roll(?) girl, Megaman's dog. A few enemy models too. Not sure how far he could really get with this and at such high amounts. I have a feeling Capcom might just step in. It's going to reach it's goal, possible 10x over. Then Capcom is going to sue him for ripping off Mega Man. Then we'll never see this game and we still won't get a new Mega Man. I hope I'm wrong, but that looks like a clear rip off of Mega Man, going to be too close to copyright infringement. And as he states in the video, he does not have the rights to Mega Man sadly. 2.5 mil for Wii U? What? Well, at 400k on day one.... we may see it but... I doubt it.... I kind of find these Kickstarter things kind of dumb anyway when you think about it. People are looking for money to develop a game so a whole bunch of people pay them cash for them to make it and then..... they sell it.... for even more.....when typically, you'd think you make the game and then earn back your work from people buying it.. Now say if they were to get 2.5 mil... I don't know many games that require that kind of cash to create them unless they have some major high end equipment and hiring for voice actors or actions for motion software/hardware but a side scrolling platformer? They are surely going to profit if they reach that stretch goal. Ooooooh I hope it happens! I would buy this so quickly on Wii U! @DarkCoolEdge I was shocked to see the price. $900k? 2.5M for console versions..? That's ridiculous. Especially coming from someone who I assume is already quite wealthy. I'd try the game if it came out on 3DS or console but I won't back this. This looks awesome, and if it makes it to consoles I will absolutely buy it, but I find it ironic that he says he listens to his fans, and cares about his fans, but his fans (typically console gamers) are the last ones to get the game, if they get it at all. I was skeptical but that actually does look pretty cool. Already past 500,000. I think it is safe to assume at this rate it will at least make the first goal lol. This is awesome! I hope we do get a Wii U version because this will most likely be the only Mega Man game we'll be getting on the Wii U for awhile. So Inafune could what Capcouldn't? This looks awesome, For me this is actually better than a new official Mega Man game, since he can try outlandish ideas without worrying about fans crying foul that he "ruined" Mega Man. I will check to see if I can pledge for this. I want to play this on a console, and I want Wii U to be that console. This game does look as if it may get shut down due to copyright infringement.Did anyone see the red dog ala mega man?Even the name of his company sounds very close to capcom....It is a very passionate video that makes you want to care,Good luck to him. The first thing I've ever backed. Looks interesting but the spirit behind it is amazing! The pace has slowed over the day but I see it making all those goals. I don't even like Mega Man that much and I'm game. Actually according to the some laws, you can't legally ripoff yourself. John Fogerty, leader of seminal 60s band Creedence Clearwater Revival, was actually sued for "self-plagiarism" because his solo songs(which were a separate publishing deal and different label from his former band) sounded too much like CCR. Good thing Inafune isn't from America XD. Great to see Inafune finally making another game..most notably a Megaman clone. Pretty exciting really. Also wow this Kickstarter is really kicking along..$542,000 pledged and still 30 days to go! Capcom couldn't give to Mega Man (Inafune's creation) the treatment it deserves, so why not starting anew then? The concept and design, the level design, the characters... yep, a Mega Man spiritual successor indeed. Definitely gonna back this up: Mega Man fans wanted a new game, and if Capcom doesn't care much about it, so be the legendary Inafune who makes the proper job. True, it's not THE Mega Man, but in essence and spirit, it'll be the same and that's what matters. At the time of writing this post, $545k have been pledged: at this rate, I am 100% positive it will reach all stretch goals. Depends on how many people you need to do it how much it costs. (If you look at the credits for Bastion you see SuperGiant games is like 5 or so people presumably all highly skilled. Whereas the publisher has hundreds of credited people who didn't actually do anything in terms of creating the game). I think a lot of you have no idea how much it costs to actually make a game, especially with a small studio like Keji's. Obviously he started his company with people who have experience and skills. So let's say you have one game you are working on, you have at least 3 programmers paid $60.000 a year (Bare minimun when you start in this business, at least, around here), that's $180,000. Then you have, let's say 2 artists for $50,000 a year which means another $100,000. Consultants, let's add another 2 at $70,000 (Because we have consultants here that are paid way more here) and thats another $140,000 ... we're already at $420,000 in yearly paid salary and I haven't even begun to list the other people that might be on this project. This don't include any company benefits that they might pay either. Add operating costs : city taxes, building rental/purchase costs, electricity, licenses fees, trademark fees, lawyer fees. My point is, you people think things are free in life when they really aren't. A small studio like the one Keji has can't afford to make 3 million games a year. If they are have one project or 2 going, they propbably have to hire outside sources as well. And quite frankly, $900000 seems rather low especially knowning the living cost in Japan. What are they going to do with all that extra money? The campaign is on fire!! @NbaJunkie Actually he is the father of megaman, he cannot use megaman name but all his art style remains intact. just pledged 99. just gotta put 33 dollars to the side in my next few paychecks. so stoked for this! It looks like a pre-release of Halo 6! 2,500,000 for THIS?! It's a 2D platformer!! It's already almost at 600,000! I wouldn't be surprised if it reaches the initial 900,000 goal before 24 hours. This is awesome. This will definitely be the first Kickstarter I back! I'll wait til it reaches its goal though so I can make sure it reaches that Wii U stretch goal. @ricklongo Still, even recycling your ideas isn't ripping yourself off. Besides, he didn't want to leave his beloved creation aside...he was forced to because another company owns that IP. So why not make another one that heavily takes from that first love and make it even better. Now sit back and watch Capcom all of a sudden, "announce" another Mega Man title. @dereq Which is why he named it "Might #9"! LOL He can't be held liable for anything. Capcom sure as heck can't sue because this game will have similarities, not carbon copies of Mega Man. This game would be better than any Mega Man game Capcom would put out anyway. You'll have the original character, plus some of the original team and music producer to helm this project. That's nothing short of win! Oh and I did learn something new today. Thank you for that info. I wasn't aware that you can be in trouble for jacking your own projects. I did understand that if it's done under a different licensing, then legal opportunists will ensure endeavors. @Melkaticox You don't think if Miyamoto was in the same boat as Inafune, he wouldn't ask for a kickstarter to make another Mario? Well a better point would be...you don't think the FANS would shell out dough for another Mario game if it has been missing for years on out? This may even make the console stretch goal it's getting backers so fast. I'm so glad this is happening, I thought the anniversary would pass without a new game! All the same though, it wouldn't surprise me if Capcom shut this down somehow just to stick it to the fans. Just pledged $40. I was too young to ever buy a new Mega Man at retail price (classic series anyway) so I figured that's the least I can do to show my appreciation. It would surprise me, what with their having no legal right to do so and all. ...believe it or not, this is actually a very cheap minimum bar to set for this team and this project, especially after fees and reward costs are taken out. We set it as low as we could to make it happen, because we really, REALLY want to make sure it happens!" i think it will reach 2.5 mil for console release too. I dont want to play this on my mac, let's reach the premium 2.5 mil goal so we can play this gem on wii U.
Pledging as soon as I get money. This looks awesome, and I've really been missing MegaMan. Let's get Beck on Wii U! I layed down in the wet grass outside Nintendo and peered into the basement window and saw Miyamoto and let me tell you, he's going all out on the one. It's called "Turtle" and you play as, you guessed it, a turtle, that, while he looks exactly like a SMW turtle, he's totally different because he has an orange shell, not green. It's sort of a stealth game where you have to walk around these big Italian Plumbers (don't worry, they're dressed in blue) and you hide in your shell when they turn to face you and sit and wait to trip them. Needless to say, I think he's on to something here and you need not worry about him recycling ideas. Before security lifted me off the grass I managed to sneak a glimpse of the title and saw the word "Curtle", so I'm guessing it might be a play off the name Curt and the wors Turtle. Whatever, when it's funded and done, enjoy. @LetsGoRetro Hahahaha This actually made my day. Seriously. I laughed incredibly loud! if this reaches the 2.5 mil goal, i'll buy it for sure. The problem with this Kickstarter is, I can't decide if I wanna be sensible and save money and just get the $20 digital copy or spend $60 on the physical box like a good retro gamer. It's already surpassed the $700,000 mark in a day. There's no doubt this'll reach the console stretch goal. I will donate a big sum to this. My summer money is ready. @Philip_J_Reed I dunno. It's similar but not the same. They're not reusing characters, music, or code from Mega Man. They may get away with this. I know that. The comment I was responding to didn't. Capcom wouldn't have a leg to stand on here. There's no danger at all. I've never wanted to back anything on kickstarter before ... but im seriously considering this. i would back $120 myself. this game sounds legit. hope they make enough to create a Wii U version. I hope this happens for them. If it reaches $2 million, I'll probably give the $20 minimum to get a copy on Wii U.
I will only buy this on Wii U, but it's good that they are including all the home consoles as part of the same stretch goal, because then Xbox 360 and PS3 owners will get it onto Wii U, too. Also, I hope it's in 3D. I actually thought the concept art was 3D until I took a closer look. As much as I love both Inafune and Mega Man, and as much as I myself have backed this game despite never having backed one before: Inafune didn't create Mega Man. He himself has never grown tired of stating this. He had been working on enemy designs and boss designs, until his first major character creation for the MM series had been Zero. Inafune might have been on board for nearly everything Mega Man, but he did not create him. @Rafie There are tons of games on Kickstarter similar to this one...none of them ask for so much money. This just may be the first thing I back from Kickstarter. Definitely want this. Glad it'll be on Wii U and PS3 (so I'll be getting it if it comes to consoles), but one question; why is this not coming to the PS4? Not that I'll be getting it, but I'm confused why they wouldn't want it on the latest platforms. Wii U is one, but wouldn't Mighty No. 9 maximize profit by being on the latest platforms? @KeeperBvK: This. I like Keiji Inafune, but too many Mega Man fans spread this around as misinformation (if unintentional). @astarisborn94 it would probably cost more to make on those consoles too..
@Melkaticox I believe it's because his (Inafune) studio is very small and they need more resources to get this game out on as many platforms as they can. It's not just the Wii U getting this, it's the PS3/360 folks too. They also pledged a great deal of money. Don't forget that the Wii U gamepad is very complex and will need extra attention to get everything right running on it. That could mean more computers and things of that nature outside of hiring skilled programmers. I think it's justifiable. Look at the number it's at already. This will get funded well before the closing date. No problem. Wow, OK So Mega Man Universe gets cancelled and this is the result a couple years later, because this is exactly what universe was supposed to be, right?! No thanks! I hope this 1 drowns the same way he abandoned Mega Man! Big News on Mighty no.9! The Stretch goal is nearly past 1,000,000... which is a BIG chance for this game to hit Xbox 360,PS3 and Wii U versions! But if this game reaches 3,000,00,then this game will HIT iOS,Android and possible portable version. It's going to make the console versions without a doubt. The portable versions are a tiny bit more of a stretch, but still within reach. Do the people complaining how much it costs have ANY idea how much game development costs? You are forming part of a collective group that pretty much hires this company to make the game. They all have to be paid, and they're far from minimum wage jobs, not to mention the rental and bills associated with their building. Then there's the cost of getting in all those dev units and the licensing fees to the console manufacturers. But Inafune himself has said that he isn't the MegaMan creator. "Inafune also revealed that he wasn't responsible for the creation of Mega Man himself. "I'm often called the father of Mega Man, but actually, his design was already created when I joined Capcom," he explained. "My mentor [at Capcom], who was the designer of the original Mega Man(...)"
@DaveGX Inafune didn't abandon Megaman. Capcom essentially barred him from it after they shot down three Megaman games. In other news...WE BROKE ONE MILLION DOLLARS! Wow, it's already up to $1.05 Million. It seems really likely we'll get console versions. I'd also buy a 3DS version if Renegade Kid gets to make it. I would totally be in on this. I just hope Capcom doesn't play legal bully given some of the concept art I do hope that isn't the case. That said, if they do I suggest the community totally got ape spit on Capcom. I, like many others, am frankly tired of their antics legal or otherwise. How about that girl in the video at 2:30 with the bright yellow hair walking her pink dog? Let's talk about that. Looks cool! But I guess Capcom will block it! !